Summer is officially here, everyone! Woohoo! I must say that it's been a rainy week here in Atlanta, so I am looking forward to catching some rays this weekend. With summer in the air and style on my brain, I'll be spending the next few days picking up some last minute things for vacation. I'd love to adorn this Judith March dress while at the beach. Isn't the mint on seafoam perfection? Add a pair of Jacks, this gorgeous bag, and a few stunning accessories, and you're ready for an evening on the Seaside town! Love that dress for summer! And that metallic tote! Love the color combo in that dress–gorgeous! Great dress! I am counting down the days to vacation too...can't wait! That dress is so pretty! I love the accessories you picked to go with it too. 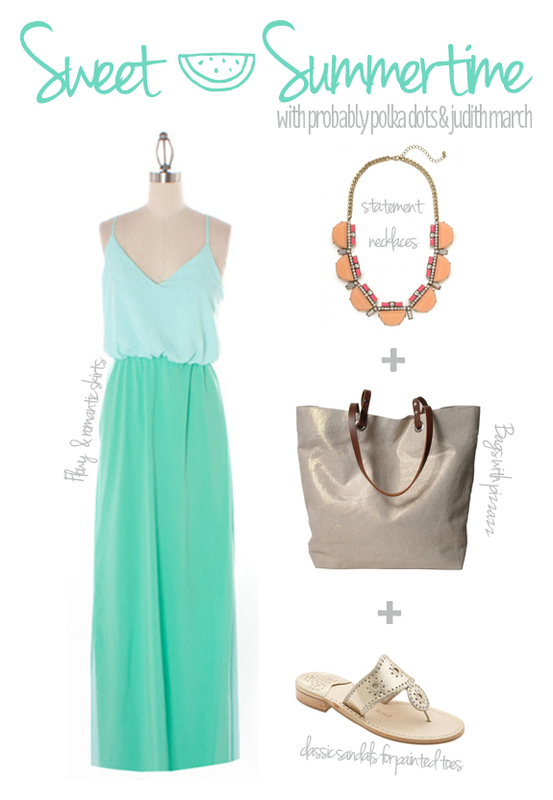 Love the mix of pastels and neutrals! Cute outfit!